When I made mitsubi for Eilene, I had leftover sushi rice. While onigiri are usually made with plain, unseasoned rice, I decided to turn the remaining rice into small rice balls. 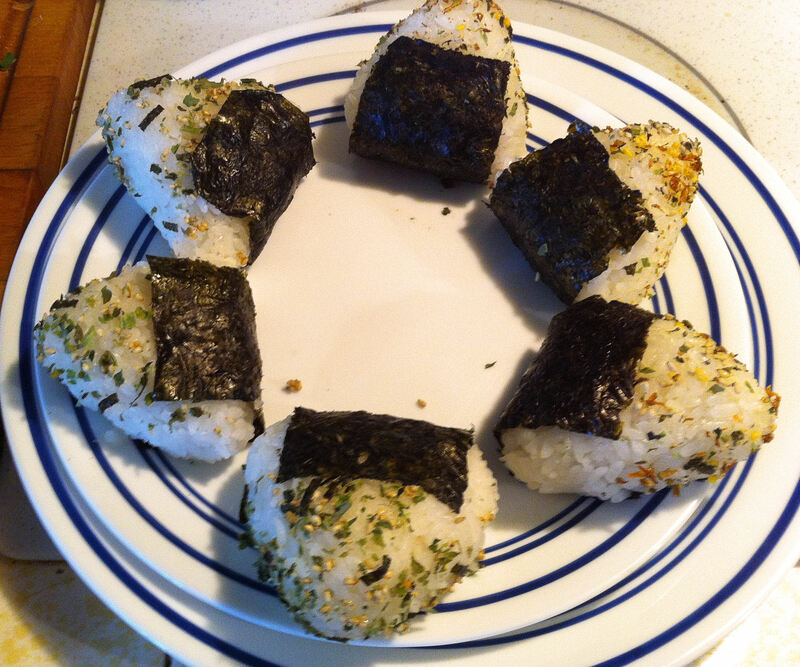 Onigiri usually have some kind of filling, with what I had on hand I chose to use Ebi Fume Furikake. Last week, Jan and I went over the hill to Santa Cruz to visit her “new” brother. While we were there, we stopped by a large book store that was going out of business. The cookbook section was fairly picked over, but as I was perusing the fiction section I found a book Izakaya: Japanese Bar food—someone had obviously picked it up and then changed their mind, leaving it “where ever.” Their loss, my gain.